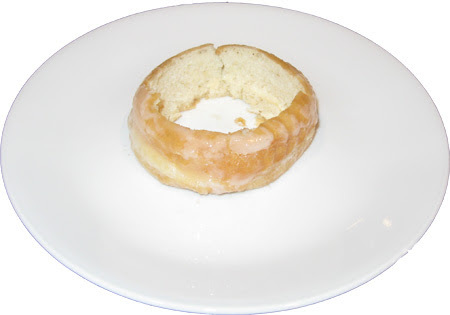 Don't ask me what made me think of it, but I'm staring at the twelve pack of donuts from the grocery store and a thought hits me: What if I...made an ice cream donut? No, not ice cream in the shape of the donut, but instead use the donut as the bowl and also as a topping. Should we try it? I'm thinking that it's been a long time since I've played with my food... in fact, it's been just shy of a year since I made this post. That's just wrong because that is way too long. Ice cream is suppose to be fun. Let's have some fun!! 1) "oh my word that's disgusting"
2) "Dubba, you evil genius you!" Well, after a taste test I can wholeheartedly say that you should go with that second thought. This treat is surprisingly tasty and actually I am quite proud of myself at the moment. It's quite the sugar rush, and to be perfectly honest, I left a bit of mine on the plate because it was just so rich. I was even surprised (and pleased) at how easy it was to scoop donut and ice cream at the same time. I definitely think the vanilla/caramel ice cream was the way to go because I wanted to compliment the donut flavor, not bury it -- this is also why I didn't drizzle chocolate on top, I thought it was too much of a risk to the donut flavor... but I bet a nice berry sauce drizzle might really be nice here. Now I just need to check the internet before i patent my stunning invention and.... DOH! I've been beaten to the punch by places like Holey Cream and Frangelli's.... or have I? 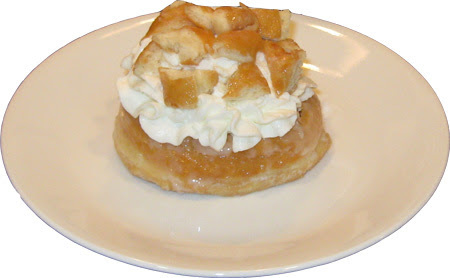 Their's is more of an doughnut ice cream sandwich, plus they use those heavy, cake-like doughnuts instead. Me, I'm going for the donut sundae vibe using a light and puffy glazed donut (similar to what you might find at a Krispy Kreme). With a little testing and tweaking, I bet this bad boy would sell like hot cakes! 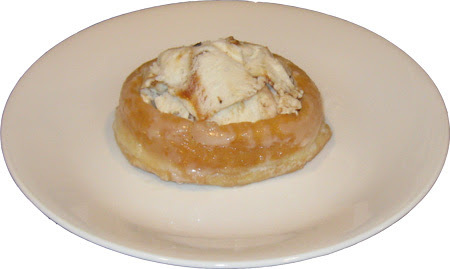 My friends and I thought of this like 10 years ago and called it donut a la mode but we just put the ice cream right in the donut hole and always added toppings like hot fudge or caramel and sprinkles. 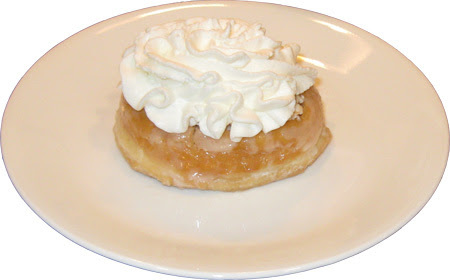 Glazed is the way to go and it is really good if you microwave them for about 5-10 seconds to get them a little warm and soft or if you can get them warm and fresh from the donut shop/bakery then that's even better. Never tried scooping out the top but I do like that idea. you crazy sugar genius I love the way your brain works. and I didnt even think to warm it! 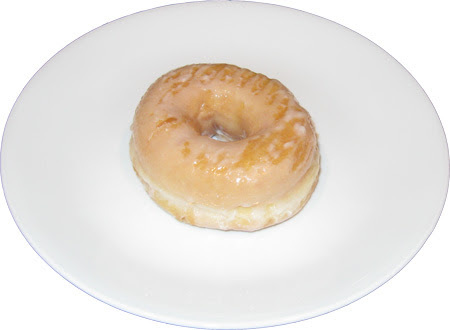 Luckily these particular donuts are super gooey and soft, but now I'm tempted to make another! Great idea, Dubba! We are going to feature it on Perry's Ice Cream blog!